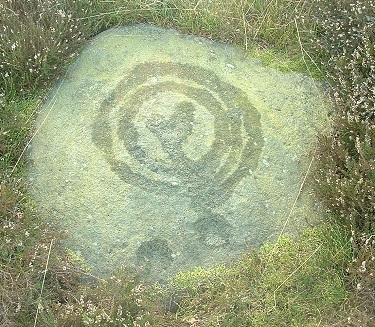 This low-lying gritstone rock is very badly eroded and the design is said to be best seen when the stone is wet and the sun low in the sky casting a shadow across the rings. 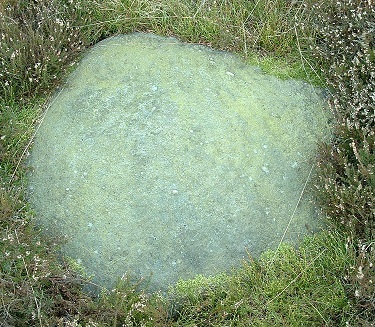 The photo above left shows the stone in flat light and the rings are nearly invisible - the photo to the right shows some of the features marked with water. Boughey and Vickerman claim three rings with a grooved running from the centre (which has some kind of indistinct design) out towards a cup with another cup close by, however local expert Paul Bennett claims four rings with two grooves running out from a pair of cups in the central area. Despite the poor state of the carvings the rock retains its former fine views over the valley of the River Wharf as the ridge of land known as Otley Chevin drop away sharply just a short distance to the north down towards the river and the town of Otley itself.